Home > Horse Sense > Horse Sense: The Odds Mean NOTHIN’. Horse Sense: The Odds Mean NOTHIN’. Many people make a healthy living handicapping horse races. Math, science, statistics, pedigree and workout times all play a role in the determination of a horse’s odds in any given race. The handicappers who hunker down over the papers and come to conclusions as to Who Will Take the Day have at their disposal the aforementioned arsenal of ammo with which to make their prognostications. The odds help bettors decide how to place their wagers, and the sport of racing Thoroughbreds thrives–or doesn’t–according to how well the bettors fared on any given day. Horses have feelings. They can wake up in the morning with a headache, a bad mood or the desire to sleep in that day. They don’t care, one iota, that they may be the favorite–and that a lot of people will be disappointed if they don’t win. The flip side of the coin is that horses also don’t care that they’re the longshot. 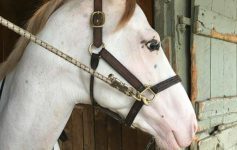 Sometimes the odds on a horse go so high that one wonders if the horse is actually in a coma, and the connections intend to prop her up and send her out there connected to an IV drip. It occurs to me that the horses’ attitudes toward the odds is the ideal way to feel about a human construct that’s intended to curse or glorify another species. And that, the horses’ utter lack of concern about odds is an attitude that we humans should adopt. Too many people–especially women and girls–care way too much about what other people think of them. Some people are actually paralyzed if they’re not liked by everyone they meet. That’s very sad, for no has the right to tell another person how s/he ought to be. Our culture has created a monster of insecurity. We’re bombarded daily with the information that, if we don’t wear/do/eat/botox/think/work at something that’s sanctioned by someone else–we are failures. That someone who set the standards is just an average person, and has no clout if we don’t give it to them. No one has the authority to tell us how we should operate, except we, ourselves. Eleanor Roosevelt advised us that no one can hurt our feelings unless we let them. Horses, on the other hand, are consummately Zen. Have you ever seen a horse on Valium? (Ace notwithstanding–and the Ace is administered by a human.) Horses, in their natural environment, may be skittish–they have a long history as prey animals, skittishness saves lives–but they never doubt the validity of their actions. So a horse on the racetrack who is pronounced as being a longshot–doesn’t believe it, for one minute. Every single horse in every race knows that, regardless of what the silly humans think–the variables that really go into determining a race’s outcome is, ultimately, in the control of the horses, themselves. They know that a longshot has as good a chance as the Big Horse on the track–if that longshot believes in herself, and refuses to let the large, black type on the program get to them–a longshot can become a Champion in the blink of an eye. Case in point: Saratoga is almost famous for being the stomping grounds of longshots who win resoundingly. I recall in 2003, three longshots took the first three positions in a race. The exacta paid $18,842. You read that right: Eighteen-thousand, eight-hundred and forty-two dollars. A $2 exacta ticket paid an astronomical number, simply because two longshots decided that that day was their day. 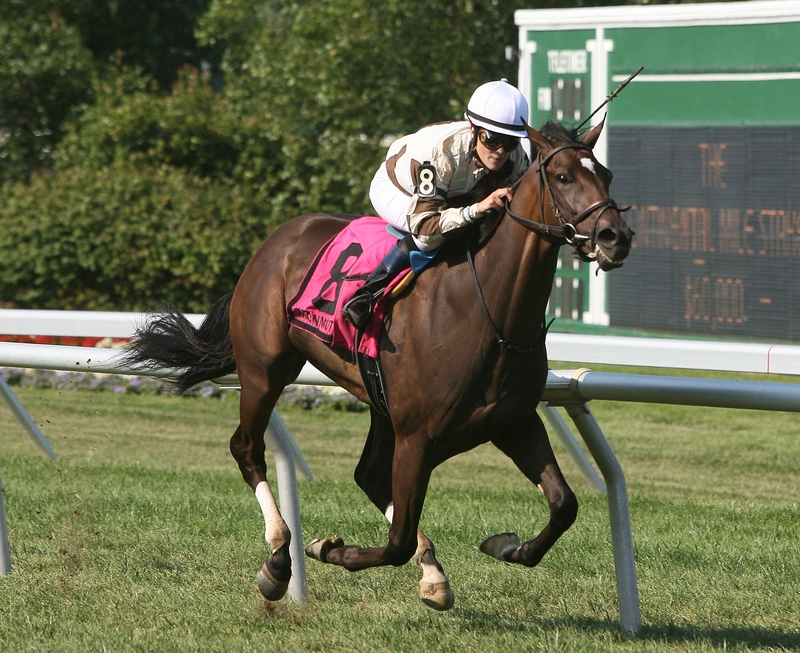 On August 15, 2009, Two Notch Road went off at 99-1 in the Continental Mile at Monmouth Park. Ridden by Shannon Uske (a woman, please note), owned and trained by Glenn R. Thompson, the gelding started his day at 20-1. By the time the race went off, bettors had heavily wagered against him, and the guy left the starting gate at ridiculously high odds. The tote board wouldn’t record anything higher, but his odds were really 107.20-1: when the handsome boy flew across the finish line first, he paid a staggering $216.40. I’m all about pedigree, but not necessarily for the reasons one might think. I believe that genetics–and spiritual connection–to talented ancestors can pass on such things as talents, intellectual tendencies and physical weaknesses. Two Notch Road has great breeding: the gorgeous two-year-old is a grandson of the great Danzig, and great-grandson of my beloved Seattle Slew. Slew is my all-time favorite Thoroughbred, and no one can tell me that, whenever one of his grands or great-grands is running–the old man isn’t there, hovering just above and entwined in the very sinews and muscles of his progeny. Just as I have the insanely thick hair of my great-uncle, Milo, and the personality of my Grandmother–Two Notch Road carries the DNA of the only undefeated Triple Crown winner, informing every cell in his body. For this reason alone, I would have bet on TNR. But many did not. And those people were sorely disappointed when the gorgeous horse sailed to a 1 ¼ length lead over his competitors–including the favorite. Glenn Thompson knew he could win. Shannon Uske knew her mount could take it. Two Notch Road, himself, knew that the odds had nothing, whatsoever, to do with his own ability–his right–to stand in that winner’s circle. The horse knew that it didn’t matter if he raced at Monmouth, Mountaineer or Dubai–the mighty Slew wrote a large chapter of his destiny. The venue had nothing to do with the horse’s innate ability to win, because location has nothing to do with belief in one’s self. The odds mean nothing in the race of Life. A million people can say that you can’t do something, it may be printed in The New York Times, and presented as Fact. The only person whose opinion of you matters is…you. If you know that you come from great stock, that you have the right to inherit the mantle of victory and success–you can do it. Ignoring the odds can only do you good. If Two Notch Road and his connections had paid any attention to that tote board, which became progressively more damning with every minute–the horse would have sat down in the gate and gotten himself scratched. Peppermints back at the stall seems like a far-better option to defeat and humiliation. But no one who knew that horse believed the ridiculous odds, not for a single minute. Most importantly, Two Notch Road, himself, knew that the oddsmakers–and surely, the misled bettors–were wrong. So wrong, in fact, he determined to show them what it looks like, how it feels–how exhilarating–it can be if we ignore the odds, and listen only to the dictates of our own hearts. The odds mean nothing. Ever. No amount of figuring, no speed figures, nothing, whatsoever, can stop a horse who knows in his very being that he has the stuff to win. And no one can ever tell any of we mere humans that which all horses have known, all along: that the odds of winning a race, equine or human, are determined not in the backroom of a racing publication or gossip girls’ blog. The odds of us winning the Race of Life, as our horsie friends know, are made only of our own belief in ourselves–or lack thereof. Previous Article Going to the Races in Saratoga: What’s YOUR Experience? Next Article Feel-Good Opportunity of the Week: Help Rescued Thoroughbreds via Columbia-Greene Humane Society Booth at Saratoga Race Course!